Cut off the end of each Brussels sprout. If there are any yellow leaves pull those off. If you like you can cut them in half...I had large ones so I did this time and they roasted a little faster. 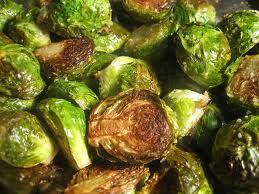 Put the sprouts in a mixing bowl and add the olive oil, salt, and pepper. Stir them well to be sure they are coated. Put the sprouts on a sheet pan and roast them for 35 to 40 minutes, if you cut them in half they light be done sooner so watch them...they are ready when they are brown and crisp outside and tender inside. I open the oven and stir them on the pan a few times during roasting to brown them on all sides. Sprinkle with more kosher salt, you want them salty, but you be the judge of this...and serve hot.